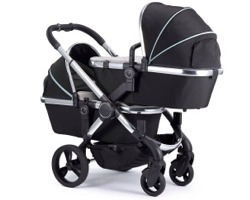 iCandy Peach - Exuding wonderfully minimalistic and discreet branding, the utmost care and respect has been taken to create the most comfortable of rides for baby. Quality, innovation and safety are the core principles of the iCandy brand, and the new Peach pram delivers a ride and experience unlike anything else on the market. Aesthetically, the new Peach stroller has been designed with the sleekest and cleanest of finishes, with subtle pops of colour introduced within the DNA of the pushchair. 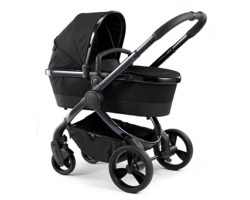 With its ultra-smooth ride, unparalleled style, and effortless manoeuvrability, the iCandy Peach has long been a favourite for many A-list celebrities including Victoria and David Beckham, Sir Richard Branson, and Bradley Cooper. iCandy Peach Twin - The multi-mode peach is incredibly versatile, it can be customised to suit the growing needs of your family. The seat unit and carrycot are larger than previous generations of the peach, offering more protection and supports babies of all sizes and weight. The fabrics used for the carrycot and seat unit now share the same frame, once your little one grows out of the carrycot, the fabrics can be stripped away using an innovative "zip in, zip out" design, transforming the carrycot into the seat unit. iCandy Peach in Nectar - Exuding wonderfully minimalistic and discreet branding, the new Peach pram delivers a ride and experience to exceed all. It's been designed with the sleekest and cleanest of finishes, with subtle pops of colour introduced within the DNA of the pushchair. No minor detail has been neglected in this creative process, resulting in its ultra-smooth ride, unparalleled style, and effortless manoeuvrability. iCandy Peach in Cerium - The Cerium Designer Collection reflects iCandy’s dedication to high design and craft, it is unlike anything else on the market. The hood fabric features an embossed soft spot pattern, providing that feeling of luxury upon every touch. A specially produced ergonomic handlebar reinforces the design expertise with every push, the substantiation of bespoke luxury with no limits. 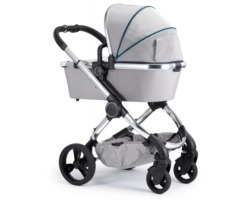 The Cerium features an entirely new frame colour, not to be seen on any other iCandy pushchair. The sleek cousin to the phantom colourway of the Peach pushchair, the dark phantom chassis is bold in nature and designed to turn heads. 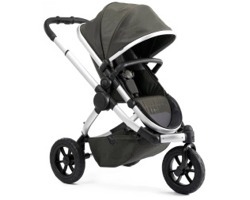 iCandy Peach All Terrain in Forest Green - The New iCandy Peach All-Terrain in Forest Green, the embodiment of sporty style, functionality and versatility has been designed to uncover the countryside off-roads. It offers supreme functionality and features over 70 modifications to previous generations of this all-terrain buggy, including a Multi Wheel functionality allowing you to convert it into four-wheel pushchair. The New All-Terrain boasts a sleek one-hand compact folding chassis with Auto-Lock system, robust air-filled tyres engineered to glide effortlessly across all terrain, all-round suspension for a smooth ride and travel system compatibility. 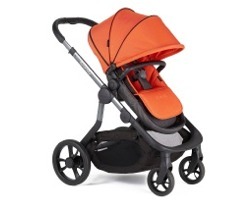 iCandy Orange - Formulated using recognisable iCandy DNA, the latest innovation from iCandy’s team of British designers is bold in style and unrivalled in ambition. The brand new iCandy Orange pushchair offers unparalleled functionality, which is infused with flawless style and rich textures. 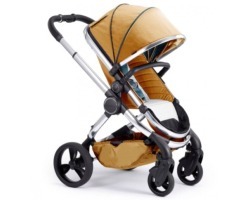 The iCandy Orange features high attention to detail, along with eye catching iCandy branding, and minimal rivets on display, creating a sleek and desirable design.